Cockroaches generally have a flattened, oval appearance, long spiny legs and long antennae. Color, which depends on species and age, ranges from a reddish brown to dark brown and from tan to black. The female cockroach deposits eggs in a reddish brown, bean-shaped capsule, which in some species, is carried at the tip of her abdomen until the eggs are nearly ready to hatch. Nymphs (immature or young) resemble adults except for their smaller size and the absence of wings. The German cockroach is by far the most likely species to infest homes in Maine. It is about 1/2 inch long, light brown, with two lengthwise black stripes on the shield behind the head. The adults are fully winged, but rarely fly. The nymphs resemble the adults but are smaller, darker and wingless. Adults live an average of 20 weeks. The German cockroach has the shortest life cycle of house-infesting roaches (from egg to egg in three to six weeks). Egg capsules remain attached to the female until the eggs start to hatch. The female produces seven egg capsules. Each capsule can contain up to 48 eggs, more eggs per case than other species. Thus, one female can generate up to 35,000 offspring per year. This explains why large numbers of cockroaches sometimes seem to appear overnight. 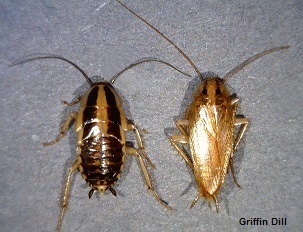 German cockroaches prefer kitchen and bathroom areas, but will disperse to other rooms as their numbers increase. Because of its size, the American cockroach is a species that is easily recognized in Maine. Up to two inches long, this insect is chestnut colored with a light yellow band around the edge of the head shield. Males and females have well developed wings; they are capable of gliding flights, but they seldom fly. Nymphs are similar to adults except that they lack a complete set of wings. It takes about 15 months for the nymph to mature to the adult stage. The adults will live for another 15 months. The female can lay anywhere from 6 to 14 egg cases in her lifetime. These egg cases can contain a maximum of 16 eggs. American cockroaches may be found in any room of the house. Although cockroaches carry disease organisms, they are not known to transmit disease to humans. They do contaminate food and kitchen utensils with excrement and salivary secretions, leaving an unpleasant odor. Roaches move rapidly, disappearing quickly when discovered. They may be found wherever food, warmth, poor light and undisturbed hiding places are available. Empty beer, soda or juice bottles and cans are very attractive to roaches. The first step in cockroach control is to keep the insects out of your home. Because they do not survive winter conditions in Maine (except for wood and Dusky cockroaches), you need not worry about them entering homes directly from outside. However, they may be transported into homes on items coming from elsewhere. Old used items are especially likely to carry the pests. Once a home is infested, the object is to deprive roaches of food, warmth, moisture and undisturbed dark cracks and crevices. Keep dishes washed, food in tight containers, garbage in tightly covered cans, dry pet food out of their reach, cracks caulked and gaps around pipes filled with steelwool. An upright, baited pint jar will trap cockroaches if the jar is placed where the roaches are likely to find it. A 2-inch wide band of petroleum jelly on the inside lip of the jar or dusting the inside of the jar with talcum powder, will prevent trapped roaches from escaping. Kill the insects by dropping them into hot water. Bait the jar with apples or potatoes. Banana peels are most attractive to German cockroaches. Change the bait frequently. If no roaches are trapped in 2 to 3 days, move the traps. Commercial traps are also available. Boric acid has low toxicity to humans and pets, but is a stomach poison to roaches. The dust acts as a “tracking powder” because the roaches get it on their feet and bodies. When they clean themselves, they get the boric acid into their digestive system. It does not repel the insects before they eat it and gives good residual control. It takes about a week to start killing. Silica aerogel dust absorbs and erodes the waterproof layer of wax on the roach’s body and causes death by dehydration. Apply the dust in cracks, crevices and void areas (under refrigerators, sinks, etc.) that are not readily accessible to children or pets. Do not apply to food or dishes. Do not use this dust in damp or wet areas, or effectiveness will be reduced. Apply only a thin layer, just enough to be seen; more is not necessary. Repeat applications as needed. Both boric acid and silica aerogel dusts are slow acting. Either one may be combined with other pesticide formulations to provide immediate and residual control. Check labels carefully for active ingredients. It may be difficult to find silica aerogel alone or in a mixture with other insecticides. Insecticides are generally available as sprays (in liquid or wettable powder form), dusts, baits, and aerosol (pressurized) sprayers. Dusts are preferred because they will disperse deeply into cracks, walls, voids and other inaccessible areas that are not treatable with other formulations. Dusts and baits are most adversely affected by damp conditions. Pyrethrum (Pyrethrin) insecticide is made from a specific chrysanthemum flower. It is used most often as spray applications. It has little residual effect, so is effective only in flushing insects out of hiding or as a contact spray. This insecticide is a common house or garden aerosol spray. Look on the active ingredient list on package labels. Resmethrin is a synthetic pyrethroid. It is a good contact insecticide and provides good residual effect. Though available as a spray, it is found primarily as an aerosol, as in house or garden insecticides. Common names (the names found on the list of active ingredients) of other effective pesticides include: cyfluthrin, permethrin, deltamethrin, and tetramethrin. A variety of formulations may be available, including sprays (liquid or wettable powders), aerosol sprays, baits or dust. No single chemical or formulation will control all cockroaches. 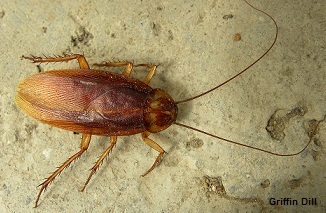 Some German cockroach infestations are resistant to one or more insecticides. Apply insecticides only to cracks, crevices, or unexposed surfaces, and not beyond the point of runoff. Avoid spraying carpets, wallpapers, or other furnishings that might be stained.